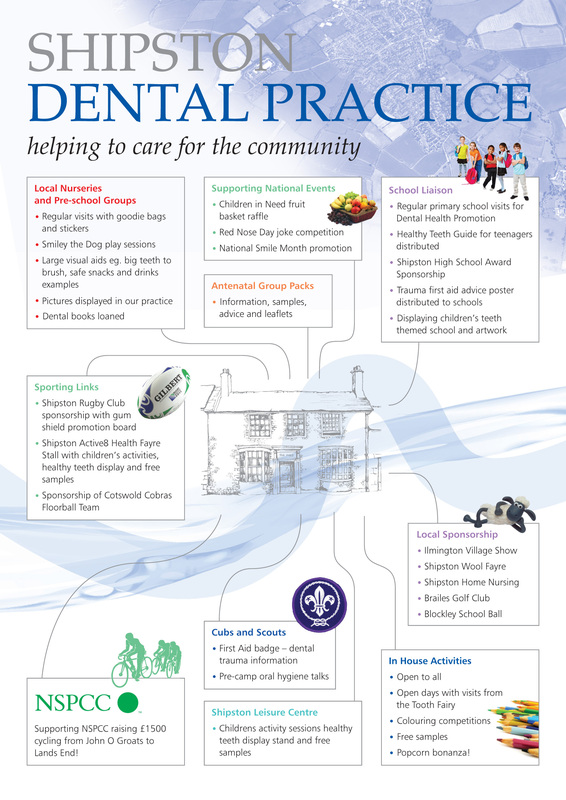 At Shipston Dental Practice in Shipston on Stour, south Warwickshire, we consider children’s dental health to be a journey, akin to the journey the River Stour takes from source to sea – that is, from infancy to adulthood. The care we provide for our youngest patients bubbles gently though the early pre-cooperative stages gradually gathering focus and direction as we take opportunity to incorporate a range of methods which encourage toddlers and pre-schoolers to play along and join the flow. Over time this develops into a steady, consistent flow of advice and support bringing older children on board, helping them to navigate the rapids of teenage-hood and pass, as smoothly as possible, into the delta of independent adulthood. Throughout this journey, at Shipston Dental Practice we aim to look after all our child patients like we would look after our own family. All children are respected for their individuality and treated in a personalised way appropriate to their needs and according to their ages and stages. Our aim is for each child to enter adulthood with a positive dental attitude, a high level of oral health and able to take on full responsibility for their ongoing dental health. 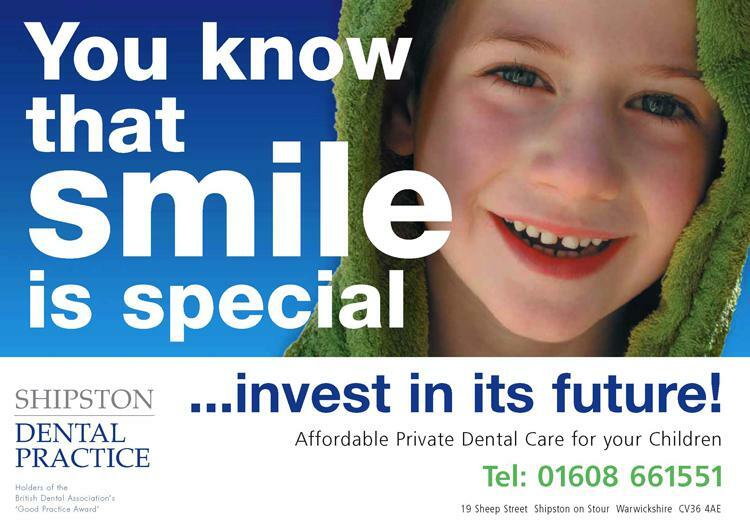 Like the River Stour flows dependably through Shipston, the availability of reliable high quality dental care is central to Shipston Dental Practice. Having been the local “family” practice for well over 40 years I took over ownership of the practice in 1996 with my husband, Ian, and business partner, Alistair Millward. Over time we have developed a complimentary range of special interests and acquired the knowledge and expertise which we feel allows the practice to offer a wide range of treatments to a high standard. This includes extensive restorative services incorporating comprehensive endodontics, implants and post-trauma care as well as in-house orthodontic treatment and inhalation sedation (RA). We feel being an independent practice enables us to retain that “local” personal touch, with different generations within families being looked after. Our whole team is focussed on patient care, going that extra mile for the youngest to the oldest. Having taken the plunge into the clearer waters of completely private practice in 2006 we have been able to further develop all aspects of patient care, working on all the tributaries and consolidating into full stream. We achieved the British Dental Association’s Good Practice in 2003 and currently hold Gold Membership. As part of my commitment to providing quality paediatric dentistry I have been a Clinical Assistant in orthodontics at Cheltenham General Hospital since 1999. I completed the BUOLD Diploma in Postgraduate Dental Studies in 2001, undertaking both the Children’s Dentistry and Orthodontic modules, and the Eastman Dental Institute’s Certificate in Children’s Dentistry in 2008. In 2010 I spent a year working part-time in the Paediatric Department at Birmingham Dental Hospital. 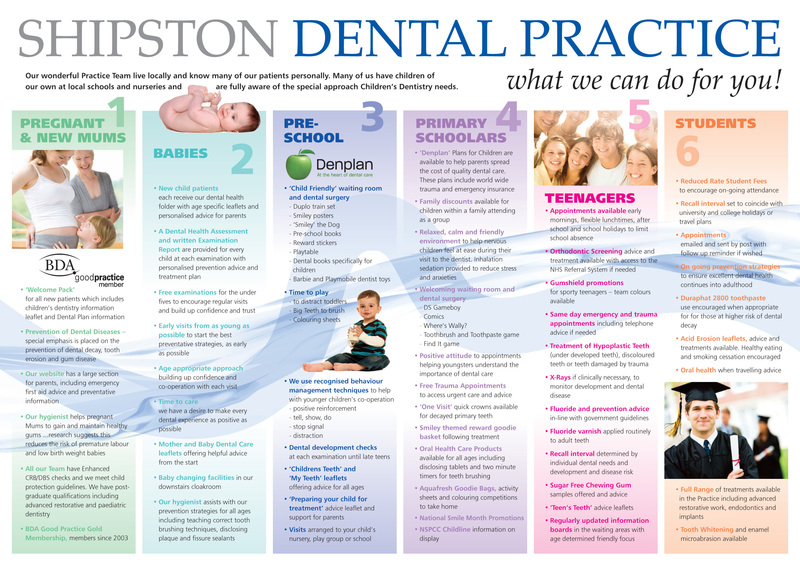 At Shipston Dental Practice we believe a truly effective Child Dental Health service needs to be a flow rather than occasional leaps off a high board. I invite you to study our two posters to see how all our initiatives over the years have permeated the local community to benefit patients and their families, the local population and probably further a field. Whilst we didn’t win the Best Child Dental Health Initiative Award we were thrilled to be nominated and to have our services to Children’s Dentistry recognised in this prestigious way – highlighting what can be achieved within a General Dental Practice team by a committed consistent flow of initiatives and a genuine desire to improve Children’s Dental Health.